After working with hypomelanistics for quite a few years, we believe that there are at least 2 different hypomelanistic forms prevalent in bearded dragons. Hypomelanistic is defined simply as a "reduction of dark pigment (melanin) when compared to a wild specimen". Hypomelanism is a genetic trait that typically results in a variable reduction of black/brown pigment, usually allowing the underlying colors to become more visual and displaying some pattern loss. Hypomelanistic is thought to be closely related to amelanistic. We have been working with the recessive form of hypomelanism since 2000. 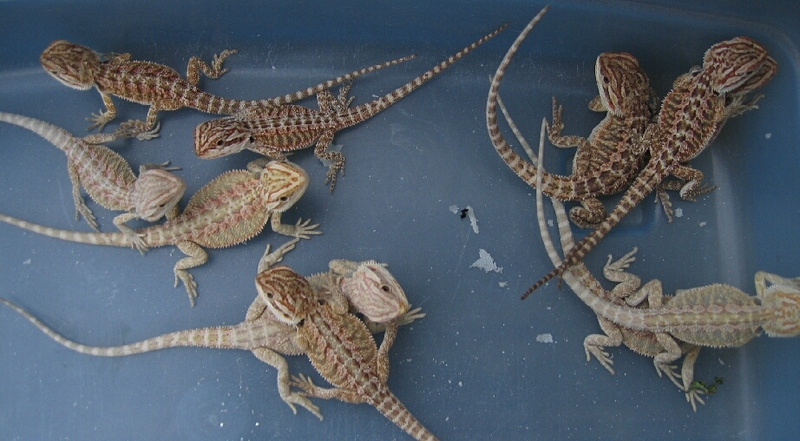 We first purchased our group of Hypo Pastel dragons from Nick Puppa in 2000. Later, we aquired another group of unrelated Hypo Pastels from Cindy Senjanovich around 2001. 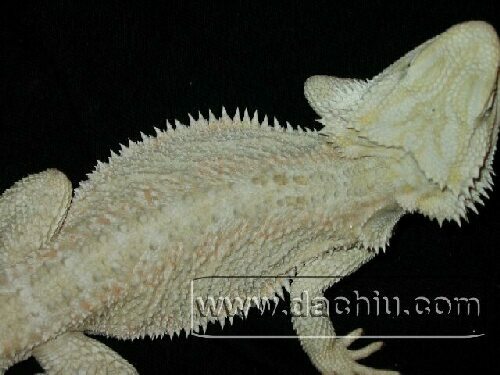 We purchased 'Leucistic' dragons from Mark Leshock and also animals from Kevin Dunne's line through another breeder. These lines formed our initial stock of recessive hypomelanistic dragons. Since then, we have out-crossed and purchased various unrelated lines to enhance and diversify our collection. Again, these hypomelanistic dragons look distinctly different right out of the egg. Note the lack of melanin in the babies head on the bottom. These 2 dragons are clutch mates from our HypoPastel/Leucistic X Yellow/Red Desert/HypoPastel line - a Hypomelanistic X Het breeding, resulting in approximately 50% Hypomelanistic and 50% heterozygous offspring. To figure out what to expect from this cross a Punnett Square is the tool to use. With the male being hypomelanistic and the female being heterozygous for the hypomelanistic trait your square would look like the following. 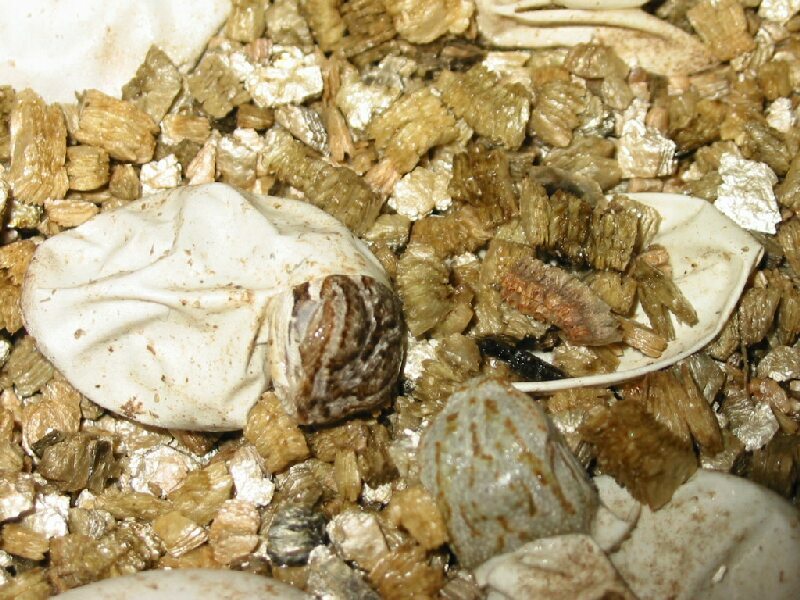 Approximately half of the clutch has the potential to hatch hypomelanistic. Any animals that do not hatch hypomelanistic are heterozygous for the hypomelanistic trait. This is'nt the exact percentage of each that will hatch out of a given clutch - it is the percentage of probability that each hatchling has to display the desired trait. HypoPastels / Pastels are recessive hypomelanistic animals bred from colored lineage that will breed true to the Punnett Square. The 1st Pastel group we acquired typically had bright orange heads and pale yellow bodies and would seldom phase in and out of color. They hatched out on the small side at 3.25-3.75 inches due to their noticeably short tail length to body ratio. They typically reached a maximum length of 18 inches as adults, generally had a mild temperament and faired well. Since 2000, through selective breeding we have been crossing this mutation to many of our colored lines and producing some outstanding colored offspring that dont show any dark pigment. However, this in not always the case. Remember that the hypomelanistic gene is a variable one. Contrary to popular belief, these bearded dragons can still produce variable amounts of melanin - possibly resulting in a drab, grey/beige appearance as an adult. Yes these are both recessive hypomelanistic dragons. This will challenge even the best eye to determine whether an animal is a recessive hypomelanistic or not. Babies on the other hand are much easier to decipher. One glance in the bin and even the novice can pick out the recessive hypomelanistic animals. So how can you tell if you truly have a Hypo Pastel / Pastel adult? The only way to know 100% without inbreeding is to breed it to a dragon of unrelated stock that is proven to carry the recessive hypomelanistic gene and look at the resulting offspring. Although rare, just because an adult animal has clear nails and does'nt show much dark pigmentation, this does not mean that it carries the recessive hypomelanistic mutation we are discussing. 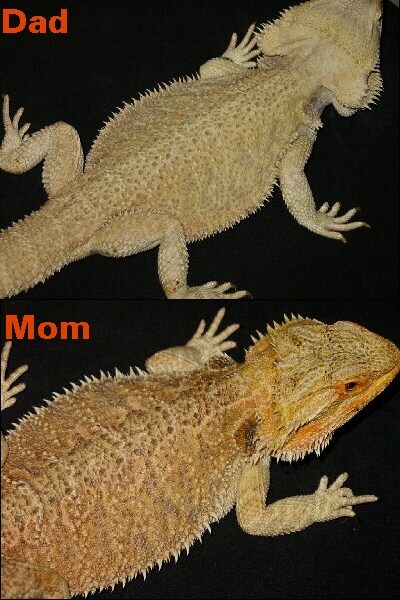 Dragons can have similar phenotypes, but different genotypes. 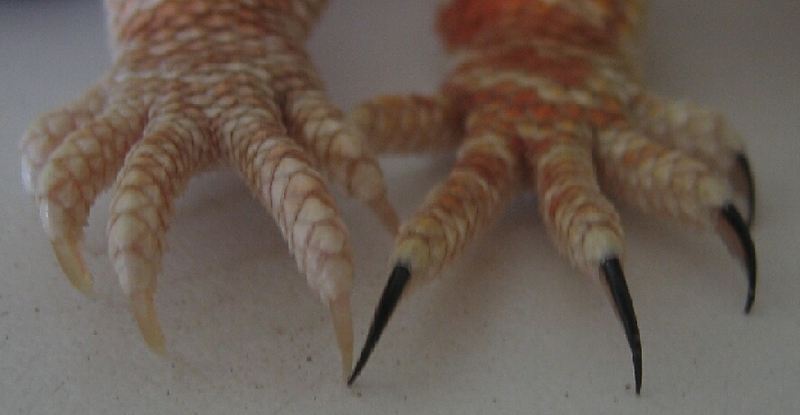 There are many lines of bearded dragons with some clear nails that also look hypomelanistic. (We believe some of these are hypomelanistic - just of a different form which we will discuss later) If like animals with some clear nails are bred together, eventually it is possible to produce an adult animal that looks hypomelanistic with clear nails and it not be the recessive hypomelanistic. This is a combination of line-bred traits that will not reproduce true to the Punnett Square. There are adult dragons and hatchlings occasionally being sold as Hypo Pastel / Pastel that are'nt recessive hypomelanistic. Some may look like Hypo Pastels / Pastels and some may not. We believe this is causing a lot of confusion. Between the variance in the melanin produced in the recessive hypomelanistic animals, color saturation, shedding process and all of the other hypos on the market, sometimes its hard to determine if a particular adult is recessive hypomelanistic... Clear nails on all the digits are a good indictor, but I wouldn't bet my life on it. 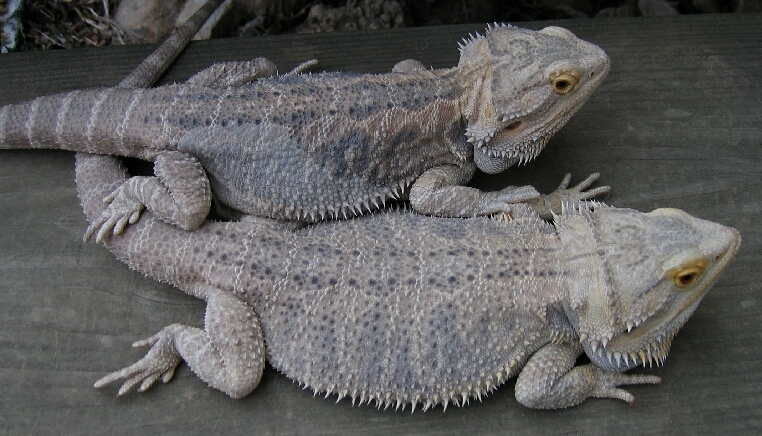 Leucistic bearded dragons were first imported from Europe to the US around 1998 by Mark Leshock. They typically did not fair well. They usually grew slow and had oddly shaped bodies with thin legs. We purchased a few hets around 2000 which did poorly also. We later purchased 2 of Mark's breeders. One animal ended up partially blind and the other which he had out-crossed did fairly well. 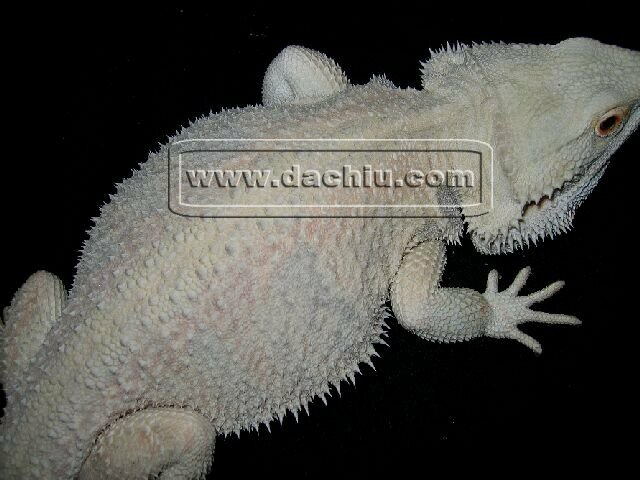 This one animal formed the basis of our initial group of leucistic dragons, with us later adding Kevin's line which was obtained through a trade with another breeder. Over the past few years we have been selectively breeding these animals to non-colored normals, hypos, and hypo/snows to increase size and vigor of the offspring; all the while trying to keep out the color - because guess what ? They are not true leucistics by genetic definition. Around 2002 we proved them to be the same mutation as the Hypo Pastel / Pastel by breeding them together and getting all hypomelanistic babies with varying shades of yellow, lavender and white. If these were two different mutations, this breeding should have produced all normal looking babies, which would have been double hets. So with that being said, we decided to market our Leucistics as "marketed leucistics". Hypos, snows, and hypo snows were already on the market, and these marketed leucistics do differ from them genetically. We believe the marketed leucistic dragons with the least visible color come from normals and the whitest marketed leucistic dragons come from the traditional hypos, snow, hypo snows (hypopigmented animals) - because recessive hypomelanistics, like the marketed leucistics, can still show varying amounts of melanin. Basically, it wouldn't hurt to have both forms of hypomelanism in your corner when trying to produce the whitest bearded dragons. • Hypo Pastel / Pastel / Leucistic / Marketed Leucistic can still produce variable amounts of melanin. Hypomelanism is a variable gene. • Hypo Pastels and Pastels are one in the same - Recessive Hypomelanistics from colored linage. • Hypopastel / Pastel / Leucistic / Marketed Leucistic dragons usually have pattern loss, especially as adults. • There are no true Leucistics on the market. • Leucistics / Marketed Leucistics are one in the same. Hypomelanistics are from normal or hypopigmented animals. • Hypopastels / Pastels / Leucistics / Marketed leucistics are all the same gene mutation. They all breed simple recessive together. • Color can be bred into the Leucistics / Marketed Leucistics. 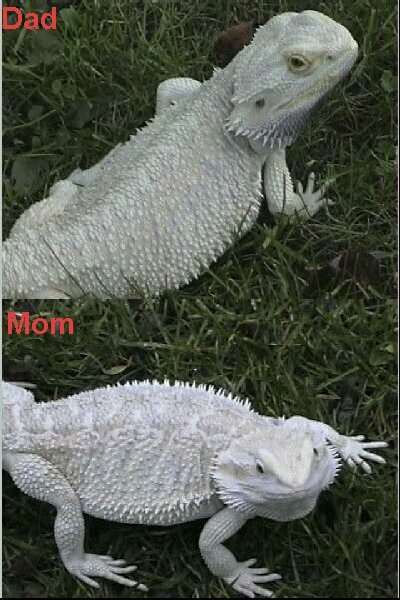 If your goal is a white looking animal do not breed them to bearded dragons of colored linage. • Babies of Hypopastel / Pastel / Leucistic / Marketed Leucistic lines are usually much easier to decipher as to whether they are recessive hypomelanistic or not, adults may need to be proved out by breeding to a known recessive hypomelanistic animal and looking at the resulting offspring. • Clear nailed animals are also a line bred trait. So just because a bearded dragon has clear nails does'nt mean its a recessive hypomelanistic animal, but it is usually a good indicator. • Do not assume all Hypo Pastel / Pastels being marketed by breeders are the recessive mutation we are discussing here. Talk to the breeder before you make your purchase. Because Marketed Leucistics are not genetically true Leucistics, should they be marketed as being such? If you feel that they should continue to be marketed as leucistics, should only the whitest individuals be chosen and be marketed as being Leucistic or should it go by lineage? We'd like to thank Rob Wood for sending us "Reptile and Amphibian Variants" - definately a great book. For those of you who would like to brush up on genetics, check out The Learning Center at VMS. Excellent site.